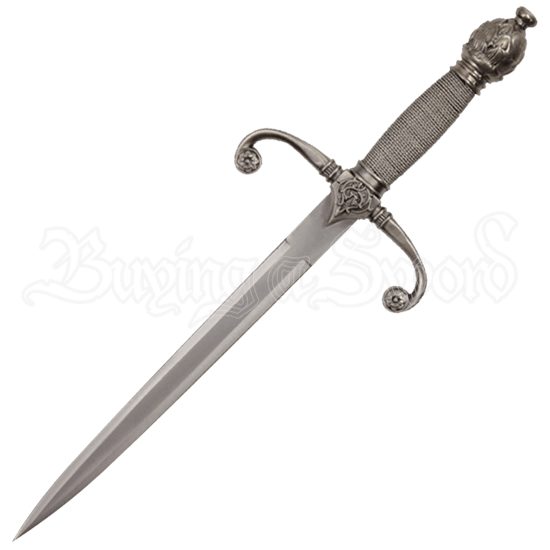 This Knights Dagger with Scabbard is designed with medieval inspiration. It would be an ideal side arm and secondary weapon for a knight costume in which the wearer wants to ensure they have multiple blades on them at all times. The blade is made from stainless steel and tapers to a sharp point. The guard features arms that curl at the ends and display floral designs, while there is also detailing where the blade and guard meet. Wire is wrapped around the handle and there is a stylized scent stopper pommel. The included scabbard features a raised design and provides a convenient and safe carry option. This collectible dagger will make an excellent addition to any medieval weapons collection.